Regulation of thermal power plants and refrigeration systems. Our regulation systems allow controlling directly and more efficiently the thermal power plants and refrigeration systems management and they are remotely controllable. Control of the thermal power plants or refrigeration systems, using a interactive synoptic scheme suitable for real time plant situation monitoring and functional parameters modification. Integration in a single measurement and control system suitable for all energy sources (traditional or renewable) used in a thermal power, with function of waste optimization. Alarms and malfunctions reporting, with automatic forwarding of information to key staff. Historical data (temperatures, activation time) and graphical and tabular visualization. Thermoregulation of boilers and circuits of users. 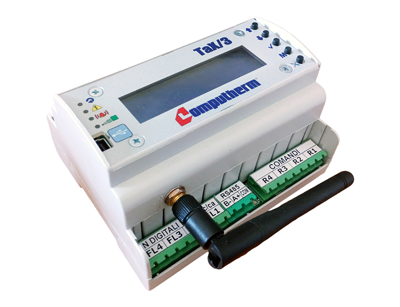 Tax3 device is designed to deliver all functional services necessary complex heating plants remote management, made for DIN rail (6 modules of breadth, 87x104 mm). Tax3 is a very easy to install and to use device, characterized by a broad expandability and versatility. This device is supplied in multiple configurations to meet the needs of a simple remote alarm, up to the control and regulation of very complex plants. Currently Italian and English language are available, but it is also adaptable to other languages. Tax3 is preset for remote control (local or by modem) by using our program T90Win, allowing the control through synoptic animated and interactive diagrams. Module for Din rail remotely controllable. 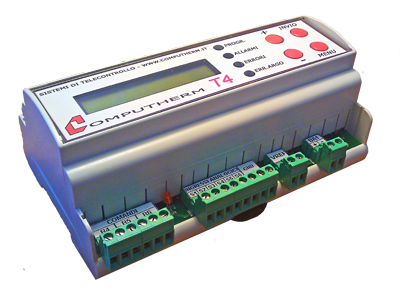 The peripheral device T4 is suitable for little standalone applications that needs remote alarm functions and a complete management of the settings. This product is expandable with a Me4444 module. This devices is available also in pre-wired switchboards for the most common systems (configurations standard).